Freeport McMoRan spent billions to get into oil, is it now admitting mistakes were made? Freeport McMoRan Inc (NYSE:FCX) made a big deal about the potential of its oil and gas acquisition in 2013. Only oil prices cratered in the back half of 2014, turning that investment into a big question mark. Now Freeport appears to be back peddling as it looks to sell shares in the business. What should you make of this new development? In 2013 Freeport acquired McMoRan Exploration Co. and Plains Exploration. The deal cost $20 billion; $9 billion for the two companies plus the assumption of around $11 billion of debt. Although it looked like it had little choice but to buy these two oil players to salvage investments in the pair, high oil prices made it look like a worthwhile expense. That said, the impact on Freeport was pretty material. Cash went from $3.7 billion at the start of 2013 to $1.9 billion by the end. Long-term debt increased from $3.5 billion to $20 billion. And the company's share count expanded by 50 million shares, ending 2013 at roughly 1 billion shares outstanding. The real problem, however, is that oil prices fell off a cliff in the second half of 2014. That led Freeport to write down goodwill by $1.7 billion in 2014 and take impairment charges totaling $3.7 billion. Although a rise in oil prices would make the impairments less meaningful, goodwill write downs are basically an admission that you overpaid for something. So, there's already an admission here that the oil investment was, perhaps, not the best choice. But the lingering issue is that the oil business is eating up a huge amount of cash. For example, in 2014 Freeport used roughly $3.8 billion for its capital investment activities. Approximately $3.2 billion of that went to oil, more than any other single area. In the first quarter, roughly $1 billion of the company's $1.7 billion in investments went toward oil. The thing is, the oil business' prospects aren't bad, assuming oil prices recover at some point down the line (the sooner the better, of course). But the costs of maintaining and expanding the business are material. Which is why Freeport was looking for partners in the space to reduce its own outlays. 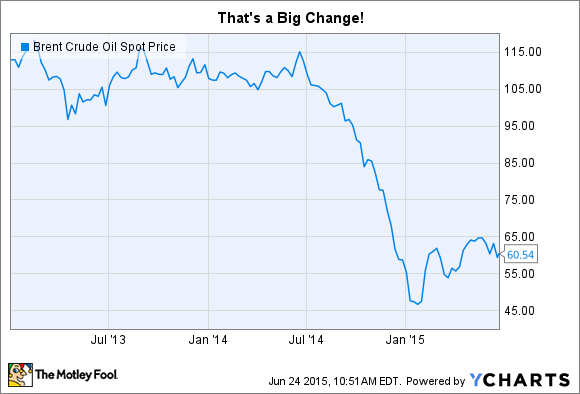 Only no one wants to invest in oil right now because the price of a barrel is so low. So, Freeport is looking to raise cash in another way: selling a portion of the oil business to the public. That said, Freeport is pitching this as a way to unlock the value of its oil business in the market. But it looks a lot more like Freeport wants to get out from under the costs of maintaining the business it bought just two years ago. In the short run that's not a bad thing, since Freeport's mining operations are suffering through a market malaise, too. Thus, cash is tight and getting creative to keep growing is a good thing. But this move is interesting for what it sets up longer term. If oil prices move higher, the sale of shares in the oil business will have proven a resourceful way for Freeport to keep growth spending up in a valuable business. However, this business so far looks more like an expensive mistake than a success. If it continues to be a drain on resources, selling shares of the oil business sets Freeport up to easily jettison this operation down the line. The path of oil prices will likely be the true determinant here, but so far Freeport's investment in oil has proven costly for the company and its shareholders. While you can frame the share sale as either creative or desperate, it creates an escape hatch through which Freeport can get out from under what has so far been an expensive dalliance. As a shareholder you should probably be pleased with this move, but be sure to keep a close eye on the oil business -- you might wind up owning it as a stand alone company some day soon.